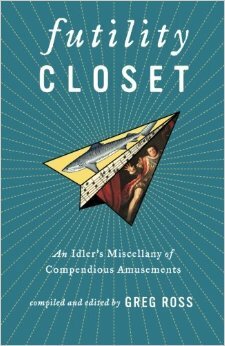 Futility Closet: An Idler’s Miscellany of Compendious Amusements collects my favorite finds in nine years of dedicated curiosity-seeking: lawyers struck by lightning, wills in chili recipes, a lost manuscript by Jules Verne, dreams predicting horse race winners, softball at the North Pole, physicist pussycats, 5-year-olds in the mail, camels in Texas, balloons in the arctic, a lawsuit against Satan, starlings amok, backward shoes, revolving squirrels, Dutch Schultz’s last words, Alaskan mirages, armored baby carriages, pig trials, rivergoing pussycats, a scheme to steal the Mona Lisa, and hundreds more. Plus a selection of the curious words, odd inventions, and quotations that are regular features on the site, as well as 24 favorite puzzles and a preface explaining how Futility Closet came to be and how I come up with this stuff. 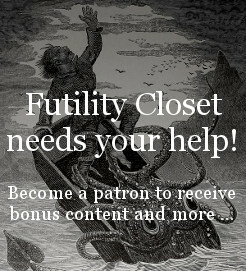 Another helping of Futility Closet’s best — hundreds of entertaining oddities in history, literature, language, art, philosophy, and mathematics, the perfect gift for people who are impossible to buy gifts for. 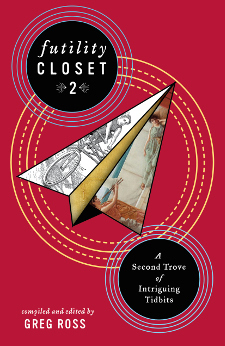 Futility Closet 2: A Second Trove of Intriguing Tidbits contains hundreds of hand-picked favorites from the site’s 10-year archive of the marvelous, the diverting, and the strange: joyous dogs, soul-stirring Frenchmen, runaway balloons, U-turning communists, manful hummingbirds, recalcitrant Ws, intractable biplanes, hairless trombonists, abusive New Zealanders, unreconstituted cannibals, mysterious blimps, thrice-conscripted Koreans, imaginary golf courses, irate Thackerays, and hundreds more. Plus the amusing inventions, curious words, and beguiling puzzles that regularly entertain millions of website visitors and podcast listeners.